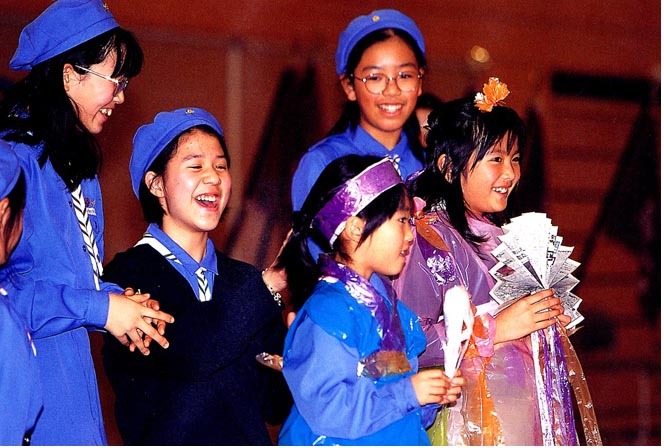 All about Girlscouting in Japan including menbership, program, uniforms, and activities with lots of pictures. 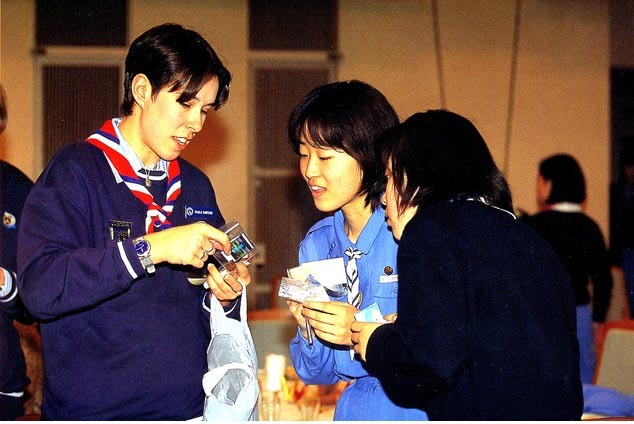 The page is made personally by Kimie Yokoi, a leader of Girl Scouts in Japan, and is not authorized by Girl Scouts of Japan (GSJ). All of contents here are quoted from brochures published by GSJ. Girl Scouts in the Senior branch select targets from the Scout program, and improve their skills and extend their interests, while helping the other Scouts in their patrol. 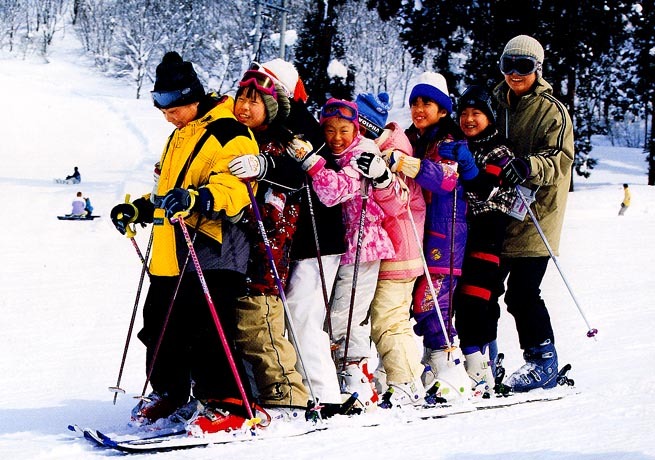 They develop creativity and find themselves through outdoor activities, volunteer works and other activities. Making the most of yourself and different experiences, which help them to find what suits them best for their future. They put the skills that they have learnt into practice to help others, and develop leadership skills. Brownie, Junior, Senior and Ranger Click icon to see bigger picture. Camp and Adult Click icon to see bigger picture. A leader must love children, and should be able to train and guide them, giving suitable education for girls, as well as looking after them and letting them play. Women aged 18 or more. 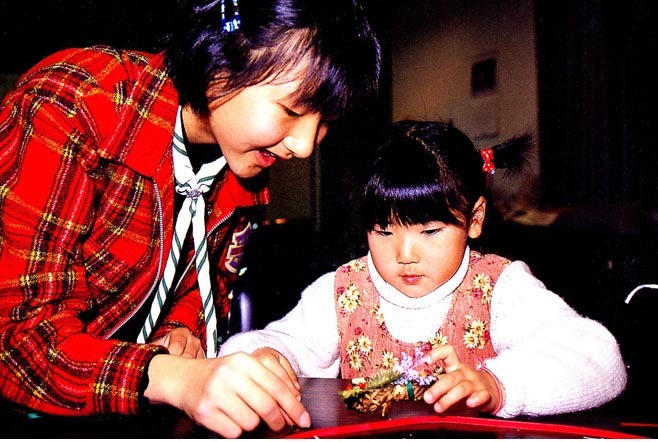 Adult Scouts must understand the basic principles of Girl Scouting, they must support and encourage Scouting, and cooperate the girl's activities by contributing their skills and knowledge. Troop committee members are selected from the girl's guardians (this may include their fathers). 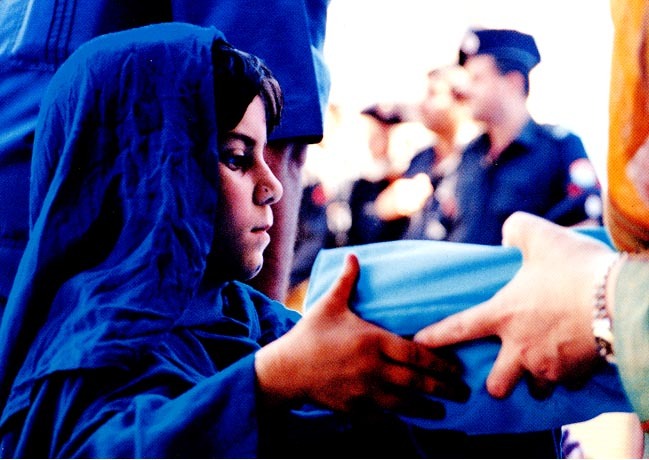 They are assigned jobs in order to help the leaders who guide the girls and to ensure that the troop runs smoothly. Membership registered as of the end of March, 1996: about 89,000 with 1,623 troops. Click icons to see pictures. 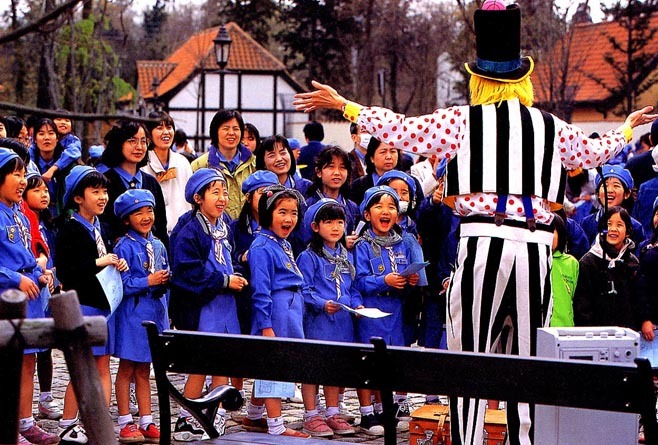 January: Cultural Exchange Program '99 to invite the UK Guiders. Friendship has been growing around the world. GSJ, photo by Tom Kishida. February: Girl Scout Gathering. 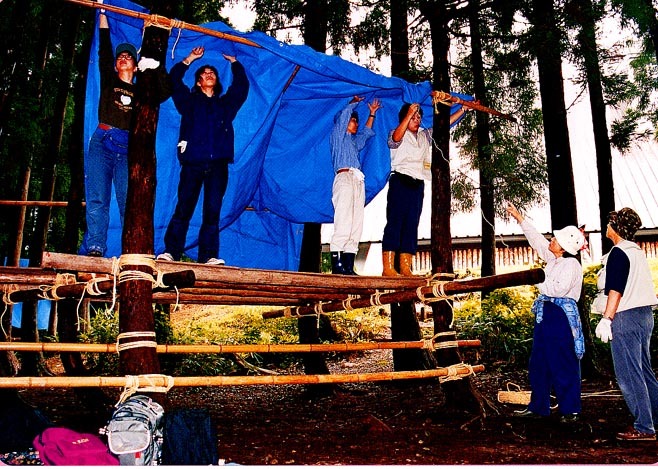 Ranger Girl Scouts from all over Japan are discussing on the theme, " Link, Build, Mobilize". GSJ, photo by Tom Kishida. 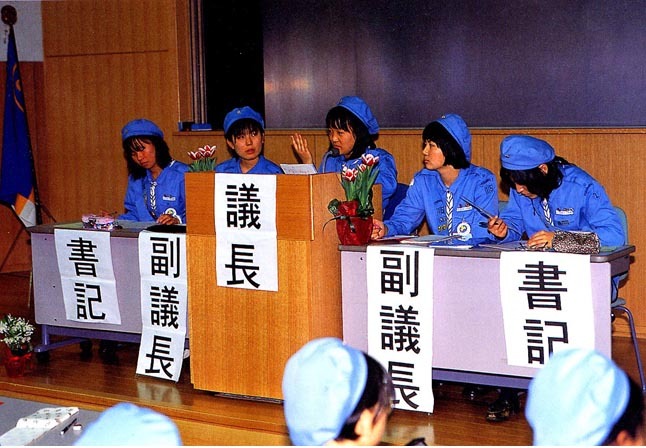 March: We got all dressed up with colored plastic sheet and newspaper, as if we were the dolls of the Girls' Festival. Troop Tokyo 5, photo by Tom Kishida. April: We spent wonderful day with lots of fun, at the rally " to find dreams". All the faces beamed with big smiles. Council Chiba Prefecture, photo by Tom Kishida. May: We walked along the street with eye bandage on. We realized how much we relied upon the sense of sight. Troops in Shizuoka Prefecture, photo by Katsunori Kishida. June: At the Day Camp. " We can't wait for the dish ready!" Outdoor cooking brings a slightly different flavor to us. 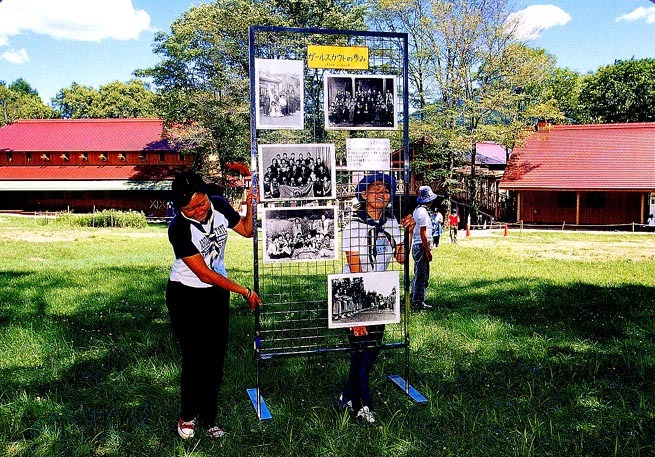 Troop Osaka 131, photo by Tom Kishida. July: First try to prepare Brazilian dishes. 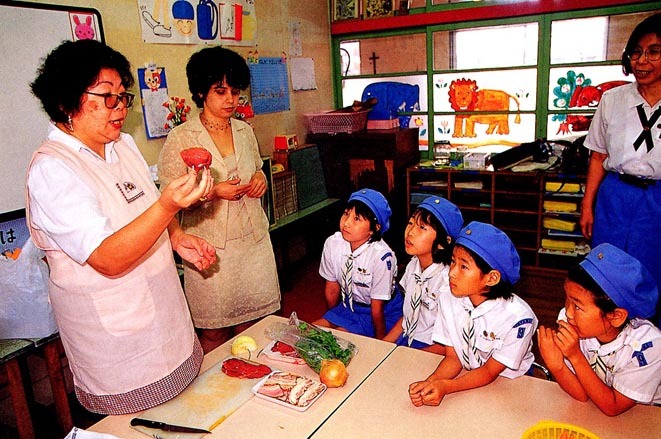 Differences in climate and culture produce foods with diversity. 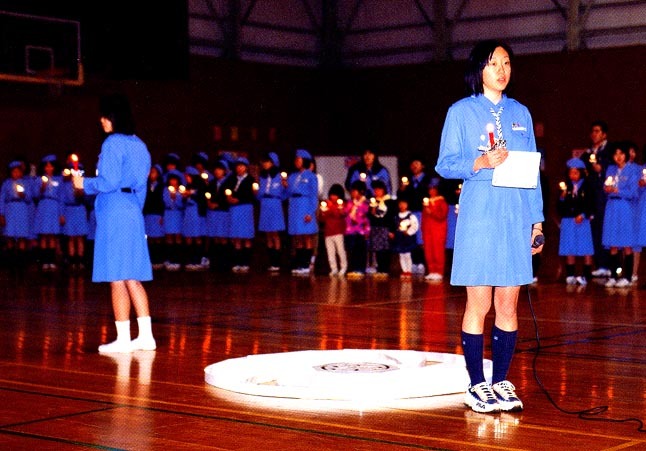 Troop Toyama 9, photo by Minoru Nakajima. August: We are all excited to make ice cream by ourselves in the farm. " Ice cream could be made this way, too!". Council Iwate Prefecture, photo by Tom Kishida. September: First-aid. Learning how to do the mouth-to-mouth respiration. Our motto is always " Be prepared". Troop Aomori 5, photo by Tom Kishida. October: Skipping a big rope. " How many times can we skip?" Teamwork is most important key to the match. Troops in Kanagawa Prefecture, photo by Katsunori Kishida. November: We were shaking all over as we got closer to a big cow, but it greeted us with gentle eyes. Council Okayama Prefecture, photo by Tom Kishida. December: Challenge to Christmas craft, " I want to put up this lovely wreath in my room at once !" 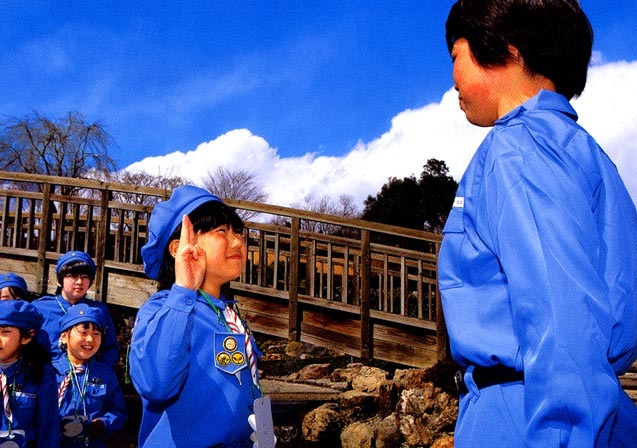 Troop Chiba 1, photo by Minoru Nakajima. January: Sparkling in the snow, having fun with best friends. Troop Gunma 74, photo by Tom Kishida. February: World Thinking Day. Thinking of sisters around the world. Troops in Chiba Prefecture, photo by Tom Kishida. March: Peace Pack. 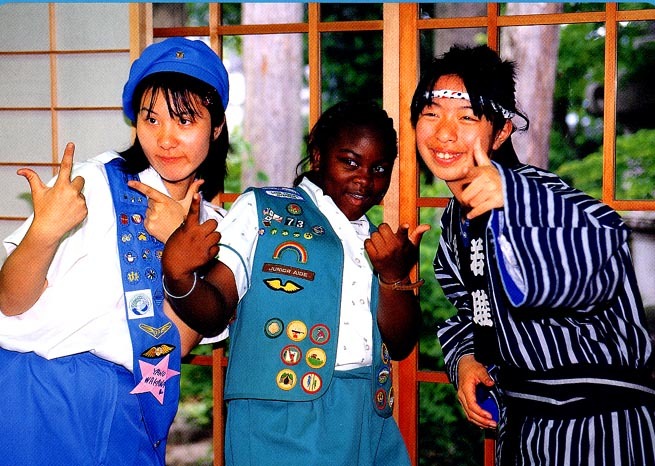 Packed with stationery and love from Girl Scouts in Japan. The 6th Mission to Pakistan by GSJ. April: My leader is always watching my development in Scouting! Troop Gunma 52, photo by Minoru Nakajima. 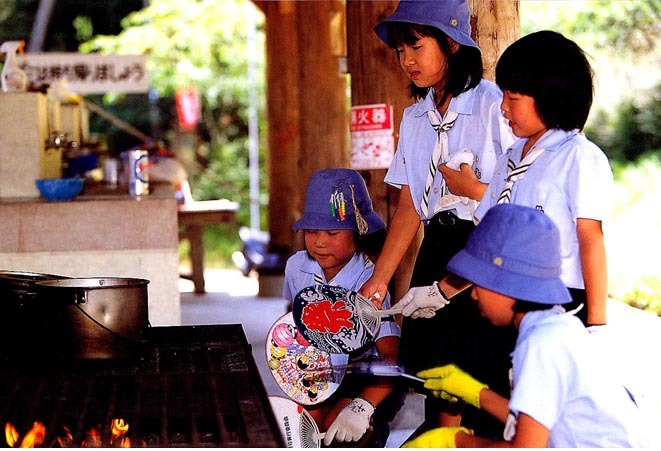 May: Girl Scouts and local people are having fun together, involving local people in the town festival. Troop Saitama 47, photo by Tom Kishida. 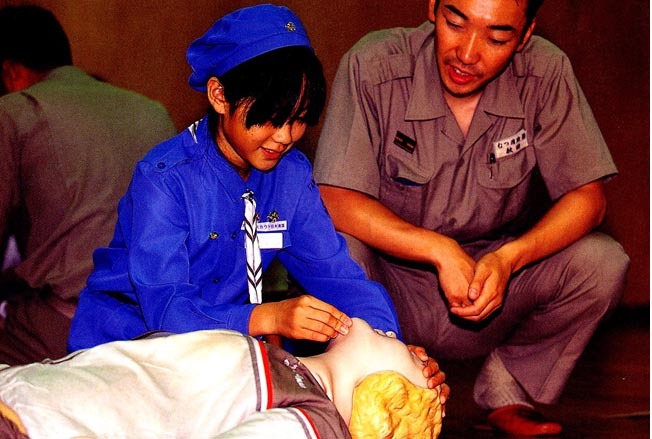 Jun: Nationality does not matter in scouting. Sisters share a good time together. Troop Tochigi 36, photo by Tom Kishida. July: Youth Exchange Programme of Korea and Japan. We, including local people, enjoyed their beautiful dance. GSJ, photo by Minoru Nakajima. August: Towards the new generation! 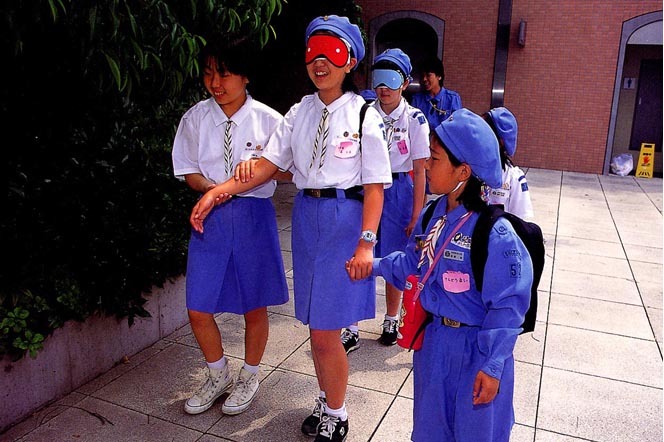 The door of Togakushi Girl Scouts Center was opened by Rangers. GSJ, photo by Katsunori Kishida. 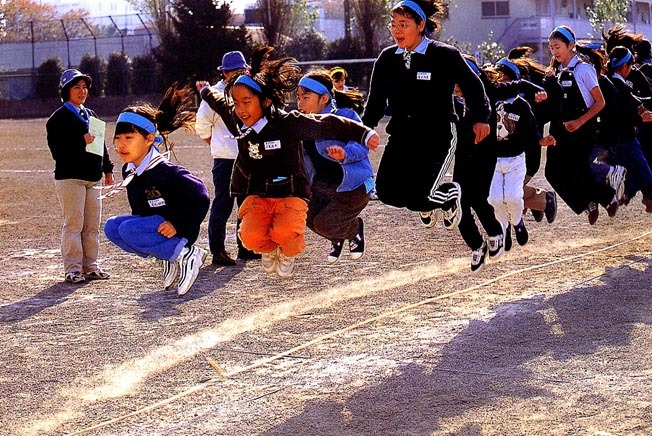 September: Adult members from all over Japan refreshing their skills and mind. GSJ. 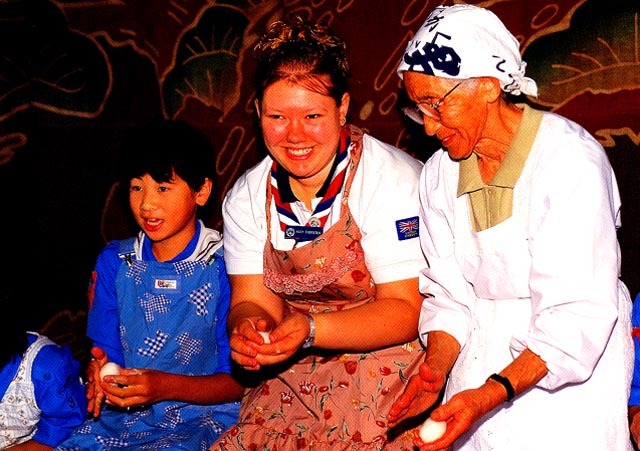 October: Becoming a Tenderfoot member.....polishing their sparkling sense. Council Aichi Prefecture, photo by Tom Kishida. November: Passing on the culture, tradition and the spirit from the past to the future. 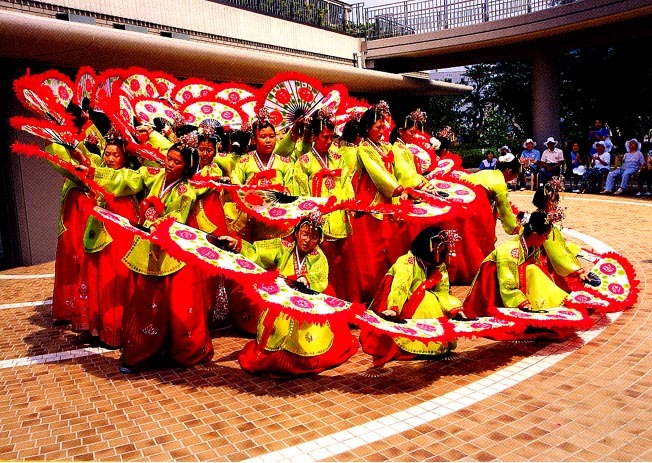 Culture Exchange Programme to invite the UK Guiders. GSJ, photo by Tom Kishida. 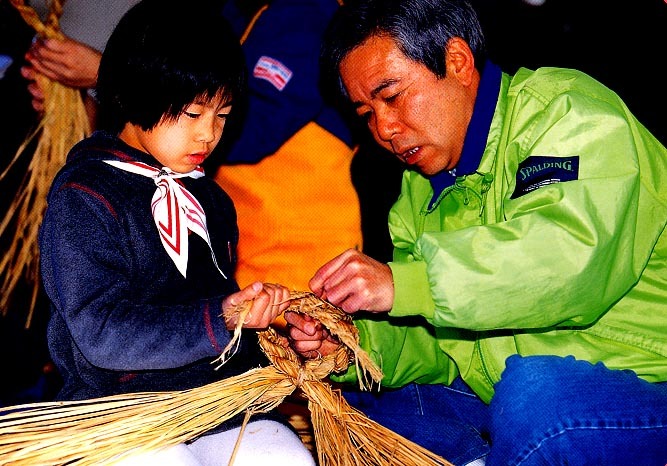 December: Learning traditional crafts from the local people. Troop Ibaragi 34, photo by Tom Kishida.